Well, the 2016 season is upon us, with teams beginning play on September 1st and conference play starting on Saturday, September 24th. The pre-season coaches' poll puts Denison in the top spot with five of nine possible first-place votes and 77 total points. Defending conference regular season and tournament champion DePauw received the remaining four first-place votes to finish second with 71 total points. Kenyon (third with 60 points) and Wittenberg (54) finish out the top four, with Wooster (46), Allegheny (42), Oberlin (24), Hiram (18) and Ohio Wesleyan (13). NCAC schools will face some strong competition, with nationally ranked opponents such as William Smith, Carnegie Mellon, Illinois Wesleyan, Thomas More, Wisconsin-Whitewater, Centre, and possibly Washington University making schedules. In addition, there are many shared OAC pre-season opponents, which should give conference watchers some sense as to how the teams are playing before conference play begins. It should be an exciting season and best wishes to all of the players and coaches! The 2016 gets started this holiday weekend with a full slate of non-conference games. On Thursday, September 1, Wooster faces Mount Union, Kenyon battles Ohio Northern, Wittenberg plays Thomas More, Hiram and Thiel square off, Baldwin Wallace visits Ohio Wesleyan, and Oberlin hosts Case. On Friday, Allegheny opens play against Nazareth. Saturday brings Wis.-Whitewater to Wittenberg, Wooster facing PSU-Behrend, Denison against Oneonta St., Kenyon at. Rose-Hulman, Allegheny vs. Rochester Inst., and Piedmont playing DePauw. The weekend ends on Sunday with Wooster playing a yet to be opponent based on Saturday's outcome, John Carroll facing DePauw, Case at Hiram, Denison playing William Smith, Muskingum visiting Oberlin, and Ohio Wesleyan hosting Franklin. Some interesting games on the schedule, with Witt facing Thomas More and UW-Whitewater, and Denison taking on William Smith. Good luck to all the NCAC teams! A mixed bag of results for NCAC teams on the first day of play in 2016. Congratulations to Coach Ross as her Battling Bishops open the season (and her career at OWU) with a 3-2 win over Baldwin-Wallace. Wooster (2-0 over Mount Union) and Hiram (4-0 vs. Thiel) also open their seasons with wins. On the other hand, Wittenberg lost to nationally ranked Thomas More (0-3), Kenyon dropped at 1-2 decision against Ohio Northern, and Oberlin was defeated by Case Western 0-1. The weekend continued to be a mixed bag for conference teams. Among the teams that opened on Thursday, Ohio Wesleyan couldn't build on its win over Baldwin-Wallace on Thursday and dropped its match against Franklin 1-3. Wooster also had a similar turn of events, losing to both PSU-Behrend and Brockport State in weekend matches after opening with a win. Hiram avoided a loss with a 1-1 tie with Case Western. On the other hand, Wittenberg came back from its loss to Thomas More with the win of the weekend for the conference, a 3-2 victory over Wisconsin-Whitewater. Kenyon also rebounded nicely from an earlier loss to Ohio Northern by defeating Rose-Hulman 4-0. Oberlin also evened its record after a 0-1 loss to Case Western by defeating Muskingum 6-3. Allegheny opened on Friday with a 0-3 loss to Nazareth but improved to draw Rochester Institute of Technology 1-1 on Saturday. Denison opened the weekend with two losses against caliber opponents, dropping a 1-2 result to Oneonta State and a 1-3 match to William Smith. DePauw came away with two wins over the weekend, with a 3-2 overtime victory over Piedmont and a 4-0 shutout over John Carroll. It will be interesting to see how both DePauw and Wittenberg fare against Capital. In inter-region play, Denison and Kenyon have matches against Salisbury and Carleton, competitive teams from other regions, and Wooster and OWU host W&J. Finally, Case continues its tour among NCAC teams, facing Kenyon and Allegheny. The mid-week slate of games has Wooster at Heidelberg on Tuesday. Wednesday is busy with Ohio Wesleyan visiting Otterbein, Grove City at Allegheny, Denison hosting Ohio Northern, Oberlin traveling to Bluffton, Centre making the trip to Wittenberg, and Franklin at DePauw. The weeknight games close with Hiram at John Carroll on Thursday. Of particular interest will be the Denison vs. Ohio Northern and Centre vs. Wittenberg matchups, though Franklin has shown some improvement and will be a challenge for DePauw as well. It was not a good mid-week stretch for the conference on the field. The highlight was Wittenberg playing Centre to a 1-1 draw. The next best result was Oberlin's match with Bluffton being cancelled. Yeah, it has been that kind of week so far. In particular, Wooster lost to Heidelberg 2-4, OWU was defeated by Otterbein 0-3, Grove City beat Allegheny 2-0, Ohio Northern got the best of Denison 1-0 and Hiram dropped its match against John Carroll 2-3. DePauw suffered its first loss of the season to Franklin in a 3-4 shootout. Off the field, DePauw did receive some good news, cracking the top 20 in the NSCCA poll, checking in at 17. The Franklin loss puts that in jeopardy but the new Tigers have the chance to burnish their credentials with two matches: Saturday against Illinois Wesleyan and Sunday against either UW-Whitewater or Washington U (St. Louis). Other matches this weekend have Kenyon hosting Thomas More on Friday and then visiting John Carroll on Sunday, a Saturday slate of Wittenberg hosting Hanover, OWU visiting Earlham, Allegheny at Pitt-Bradford, Centre visiting Denison, and Wooster at Wilmington. On Sunday, Oberlin visits Marietta. Kenyon started the weekend dropping its match against Thomas More 0-3. The woes continued for the Ladies with a loss on Sunday at John Carroll (1-4) and on Wednesday at Capital (0-3). Wittenberg had a split week, with a 2-1 win over Hanover before a 1-2 loss to Case. OWU got on the win column with a win over Earlham before losing to Wilmington 0-2. Allegheny had a successful week with wins against Pitt-Bradford (3-2 OT) and Fredonia (2-1). Denison had two, 2-2 draws for the week, with Centre and John Carroll. DePauw tied Illinois Wesleyan 0-0 before dropping its match with Wisconsin-Whitewater 1-3. Wooster lost to Wilmington and Ohio Northern by identical 0-3 scores. Oberlin gained victories over Marietta (1-0) and Heidelberg (3-0) and Hiram also had success, defeating Bethany (W.VA.) 3-0. Saturday's slate has Hiram at Wooster, DePauw visiting Oberlin, Ohio Wesleyan hosting Denison, and Kenyon traveling to Wittenberg. Sunday has Allegheny in a non-conference match against Carnegie Mellon. In conference play, I'll pick Hiram over Wooster 2-0, DePauw over Oberlin 3-1, Denison defeating OWU 3-0, and Wittenberg defeating Kenyon 2-1. On Sunday, I'll pick Carnegie Mellon over Allegheny 3-0. Here's hoping to a safe, clean weekend of play. An addition to my earlier post on mid-week. Congratulations to Wittenberg on its recognition in last week's NSCCA poll, coming in at #25. However, like the other Tigers in the conference, a tough week following the ranking likely means Wittenberg will be dropped from the poll tomorrow. Besides its loss to Case last Tuesday, the old Tigers lost to Kenyon in the opening weekend of conference play 0-1. In the rest of conference play, Hiram also had a rough opener, losing to Wooster 1-3. DePauw defeated Oberlin 4-0 and Denison beat OWU 2-0. In the sole non-conference match of the weekend, Allegheny dropped a close one to Carnegie Mellon 1-2. Midweek play on Tuesday has Muskingum at Wooster, Wittenberg visiting Ohio Northern, Ohio Wesleyan traveling to Capital, Allegheny going to Westminster, and DePauw hosting Thomas More. Wednesday has Case at Denison and Hiram visiting Otterbein. Next Saturday brings another slate of conference matches, with Kenyon traveling to DePauw, Wittenberg at Allegheny, Oberlin hosting Wooster, and Denison visiting Hiram. The one non-conference tilt has Ohio Wesleyan going to Ohio Christian. Last week, I went .500 in conference matches, getting DePauw and Denison right but missing on Wooster and Kenyon. For the upcoming conference matches, I like the Tigers with DePauw over Kenyon 2-1 and Wittenberg beating Allegheny 3-0. Wooster will take one from Oberlin 2-0 and Denison will defeat Hiram 3-0. One would think there would be big changes in the polls this week? I am still trying to find info on where the final four will be. Any updates?? Sorry for the delay in posting. Occasionally work gets in the way of both soccer and blogging. Non-conference play last week had Wooster over Muskingum (2-0), Wittenberg over Ohio Northern (2-1), Ohio Wesleyan losing to Capital (1-4), Allegheny defeating Westminster (2-0), DePauw falling to Thomas More (4-0), Denison beating Case (1-), Hiram winning at Otterbein (1-0), and OWU beating Ohio Christian, 1-0. In conference play, Kenyon beat DePauw (1-0), Wittenberg won 2-1 at Allegheny, Oberlin and Wooster tied 1-1, and Denison defeated Hiram, 2-1. As a result, I picked two winners for the weekend. So far in non-conference play this week, Allegheny lost to Buffalo St. 0-1. Tonight, Ohio Wesleyan visits Case while Hiram hosts Rochester (MI). Rochester visits Oberlin on Friday as well. This weekend's conference matches have Allegheny traveling to Denison, Kenyon hosting Wooster, Ohio Wesleyan at Wittenberg, and DePauw going to Hiram. I think Denison prevails 2-0, Kenyon defeats Wooster 1-0, Wittenberg wins over OWU 3-0, and DePauw returns with a 2-0 victory. While no conference teams cracked the NSCAA Top 25, two Great Lakes Region teams made the list (Thomas More #4 and Ohio Northern #21) while a third (Carnegie Mellon) received votes. As for the Great Lakes regional poll, Wittenberg (6), Denison (7), and DePauw (9) made it, along with Thomas More (1), Ohio Northern (2), Carnegie Mellon (3), Franklin (4), Grove City (5), Case Western (8), and Hilbert (10). Full week for the conference. Last Wednesday, Case defeated OWU 0-2 while Rochester (MI) knocked off Hiram 0-1. On Friday, Rochester (MI) continued its tour of the conference, defeating Oberlin 1-2. Saturday was dedicated to conference play, with Denison prevailing over Allegheny 1-0, DePauw beating Hiram 3-0, and Wittenberg defeated OWU 1-0. Wooster and Kenyon played to a 1-1 draw. I picked three winners but missed on the Kenyon/Wooster draw. This week, Wittenberg upheld the honor of the conference in the sole non-conference match, with a 2-1 victory over Rochester (MI). Conference play takes place tonight, with Hiram visiting Kenyon, Wooster hosting Denison, DePauw traveling to OWU and Oberlin at Allegheny. On Saturday, OWU goes to Allegheny, Kenyon travels to Denison, Oberlin hosts Wittenberg and Wooster plays at DePauw. Tonight, I think Kenyon wins 1-0, Denison wins 1-0, DePauw wins 3-0, and Oberlin and Allegheny draw. On Saturday, Allegheny wins 1-0, Denison wins 2-1, Wittenberg and DePauw both prevail 2-0. No conference teams made the NSCAA Top 25, but Wittenberg (4), Denison (5), and DePauw (8) all moved up, joining Thomas More (1), Carnegie Mellon (2), Franklin (3), Ohio Northern (6), Otterbein (7), Grove City (9), and Washington and Jefferson (10). Congratulations to Wittenberg on winning the NCAC regular season title! Conference tournament play begins tonight with #1 seed Wittenberg hosting #4 Kenyon and #3 DePauw traveling to #2 Denison. Both games begin at 7 pm ET. In the regular season meetings, Kenyon defeated Wittenberg 1-0 and Denison beat DePauw 2-0. I think that Witt gets revenge tonight while the Big Red vs. Tigers match will be hard fought and is a toss-up. The winners of tonight's matches will play Saturday on the campus of the highest remaining seed. The winner of the conference tournament will receive the NCAC's automatic bid to the NCAA tournament. Speaking of the NCAA tournament, I suspect that the conference's streak of multiple teams playing in the tournament is in jeopardy if Wittenberg wins the conference tournament as none of the other three teams have put together a resume that will WOW the selection committee. On the other hand, if Witt does not win the conference tournament, I think it has the record and quality wins that would justify an at-large bid. Of course, we will find out on Sunday. As expected, #1 Wittenberg got revenge for its regular season loss to #4 Kenyon, scoring early (two goals in the first 22 minutes) and often (3 goals total) to shutout the Ladies. In the other match, #3 DePauw battled #2 Denison for 85 scoreless minutes until Denison was awarded a PK, which it converted. The Big Red held on for a 1-0 win. The conference finals will be played on Wittenberg's campus at 7 pm. The winner receives the conference's automatic bid to the NCAA tournament. The question is whether the loser has a chance at an at-large bid. 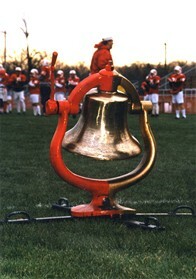 Wittenberg seems highly likely to receive an at-large bid if the Big Red upset the Tigers tomorrow night. At 12-3-2 in Div. III matches (and 13-3-2 overall) and with a 3-1-1 record against regionally ranked teams, Witt presents a strong case. The question is whether Denison gets an invitation should it lose to Witt. Denison would end up with a 9-6-4 record and a 1-4-1 record against regionally ranked teams. It probably isn't enough to get in, but we will find out for sure soon.